This Napa Cabernet Saugivnon is a small 400 case production from a winery that really focuses on Sonoma County Pinot noir but does make an excellent Cab. It was aged in 75% new French oak and the grapes were sourced from "several small vineyards throughout the valley". On the nose a get the classic Napa valley forward fruit aromas of raspberry, mixed berry, cassis, chocolate, and a good amount of spice from the oak. It's very extracted and dark in color and you can almost smell the richness! Everyone who drinks big Cab should be able to understand the comment "smelling the richness". Even though it's a statement that doesn't make a whole lot of sense in literal speak, there is some wine where I swear I can almost smell the extraction, richness, and power therein. On the palate the wine shows extreme power and intensity, lots of extracted black fruits such as black raspberry and crushed currants. There is a spiciness imparted from the oak aging and some really nice dark chocolate notes. 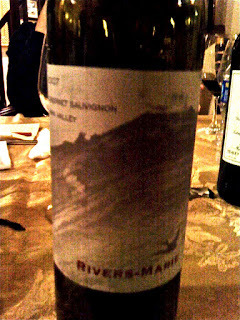 The finish is quite extended, dry, and gripping.......very young wine with plenty of bold tannin. sounds like a fabulous Napa wine. I enjoyed your blog very much! Found you on foodbuzz. It's great to hear that you appreciate a good Cab! If I may, I'd also like to recommend that you try some multi-appelation Cabs! I find that multiple-appellation sourcing leads to quite interesting blends – we view the process at Ghost Pines similar to that of varietal blending, since even the same grape from different counties will have its own unique character (every crop is soaked in its individual landscape and climate). Louis M. Martini developed the Ghost Pines brand, in fact, to explore this unique winemaking method. So we might round out the bold structure of a Napa Cab with some grapes from Sonoma. A lot of grapes from different California counties complement one another as richly as Syrah and Grenache might.